In this paper, we report the feasibility of integrating a novel low cost optical coherence tomography (OCT) system with a dermascope for point-of-care applications. The proposed OCT system is based on an enhanced time-domain optical coherence tomographic system, called multiple reference OCT (MR-OCT), which uses a single miniature voice coil actuator and a partial mirror for extending the axial scan range. The system can simultaneously register both the superficial dermascope image and the depth-resolved OCT sub-surface information by an interactive beam steering method. A practitioner is able to obtain the depth resolved information of the point of interest by simply using the mouse cursor. The proposed approach of combining a dermascope with a low cost OCT provides a unique powerful optical imaging modality for a range of dermatological applications. Hand-held dermascopic OCT devices would also enable point of care and remote health monitoring. S. Feng, R. Caire, B. Cortazar, M. Turan, A. Wong, and A. Ozcan, “Immunochromatographic diagnostic test analysis using Google Glass,” ACS Nano 8(3), 3069–3079 (2014). E. Jonathan and M. J. Leahy, “Investigating a smartphone imaging unit for photoplethysmography,” Physiol. Meas. 31(11), N79–N83 (2010). J. Bennett, “Top Ten Medical Uses of the iPhone”, http://internetmedicine.com/2012/12/14/top-ten-medical-uses-of-the-iphone/ , Accessed: 12th December (2013). R. P. Braun, J. H. Saurat, and L. E. French, “Dermoscopy of pigmented lesions: a valuable tool in the diagnosis of melanoma,” Swiss Med. Wkly. 134(7-8), 83–90 (2004). R. P. Braun, H. S. Rabinovitz, M. Oliviero, A. W. Kopf, and J. H. Saurat, “Dermoscopy of pigmented skin lesions,” J. Am. Acad. Dermatol. 52(1), 109–121 (2005). A. Lallas, G. Argenziano, Z. Apalla, J. Y. Gourhant, P. Zaballos, V. Di Lernia, E. Moscarella, C. Longo, and I. Zalaudek, “Dermoscopic patterns of common facial inflammatory skin diseases,” J. Eur. Acad. Dermatol. Venereol. 28(5), 609–614 (2014). A. Lallas, A. Kyrgidis, T. G. Tzellos, Z. Apalla, E. Karakyriou, A. Karatolias, I. Lefaki, E. Sotiriou, D. Ioannides, G. Argenziano, and I. Zalaudek, “Accuracy of dermoscopic criteria for the diagnosis of psoriasis, dermatitis, lichen planus and pityriasis rosea,” Br. J. Dermatol. 166(6), 1198–1205 (2012). K. Peris, T. Micantonio, D. Piccolo, and M. C. Fargnoli, “Dermoscopic features of actinic keratosis,” J. Dtsch. Dermatol. Ges. 5(11), 970–975 (2007). A. F. Fercher, W. Drexler, C. K. Hitzenberger, and T. Lasser, “Optical coherence tomography - principles and applications,” Rep. Prog. Phys. 66(2), 239–303 (2003). R. Leitgeb, C. Hitzenberger, and A. Fercher, “Performance of fourier domain vs. time domain optical coherence tomography,” Opt. Express 11(8), 889–894 (2003). M. Choma, M. Sarunic, C. Yang, and J. Izatt, “Sensitivity advantage of swept source and Fourier domain optical coherence tomography,” Opt. Express 11(18), 2183–2189 (2003). V. D. Nguyen, N. Weiss, W. Beeker, M. Hoekman, A. Leinse, R. G. Heideman, T. G. van Leeuwen, and J. Kalkman, “Integrated-optics-based swept-source optical coherence tomography,” Opt. Lett. 37(23), 4820–4822 (2012). B. I. Akca, B. Považay, A. Alex, K. Wörhoff, R. M. de Ridder, W. Drexler, and M. Pollnau, “Miniature spectrometer and beam splitter for an optical coherence tomography on a silicon chip,” Opt. Express 21(14), 16648–16656 (2013). E. Pennings, G. D. Khoe, M. K. Smit, and T. Staring, “Integrated-optic versus microoptic devices for fiber-optic telecommunications systems: A comparison,” IEEE J. Sel. Top. Quantum Electron. 2(2), 151–164 (1996). V. D. Nguyen, B. I. Akca, K. Wörhoff, R. M. de Ridder, M. Pollnau, T. G. van Leeuwen, and J. Kalkman, “Spectral domain optical coherence tomography imaging with an integrated optics spectrometer,” Opt. Lett. 36(7), 1293–1295 (2011). Insight, “Small (and shrinking) Form Factor”, http://sweptlaser.com/small-form-factor/ , Accessed: 10th July (2014). J. Hogan, “Multiple-Reference Non-Invasive Analysis System,” U. S. Patent 7,526,329 (28th April 2009). J. Hogan, “Frequency Resolved Imaging System”, U.S. Patent 7,751,862 (6th July 2010). A. G. Podoleanu, G. M. Dobre, D. J. Webb, and D. A. Jackson, “Simultaneous en-face imaging of two layers in the human retina by low-coherence reflectometry,” Opt. Lett. 22(13), 1039–1041 (1997). M. Zurauskas, J. Rogers, and A. G. Podoleanu, “Simultaneous multiple-depths en-face optical coherence tomography using multiple signal excitation of acousto-optic deflectors,” Opt. Express 21(2), 1925–1936 (2013). 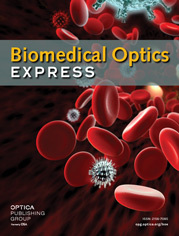 Nano optic devices, “Expanding light possibilities”, http://www.nanoopticdevices.com/ , Accessed: 11th July (2014). Tornado spectral systems, “Spectrometer-on-chip for OCT”, http://tornado-spectral.com/solutions/spectrometer-on-chip-oct , Accessed: 11th July (2014). A. Kasukurti, M. Potcoava, S. A. Desai, C. Eggleton, and D. W. M. Marr, “Single-cell isolation using a DVD optical pickup,” Opt. Express 19(11), 10377–10386 (2011). D. P. Popescu, L.-P. Choo-Smith, C. Flueraru, Y. Mao, S. Chang, J. Disano, S. Sherif, and M. G. Sowa, “Optical coherence tomography: fundamental principles, instrumental designs and biomedical applications,” Biophys. Rev. 3(3), 155–169 (2011). K. H. Kim, M. C. Pierce, G. Maguluri, B. H. Park, S. J. Yoon, M. Lydon, R. Sheridan, and J. F. de Boer, “In vivo imaging of human burn injuries with polarization-sensitive optical coherence tomography,” J. Biomed. Opt. 17(6), 066012 (2012). Fig. 1 Experimental setup of a dermascope integrated MR-OCT system based on bulk optics configuration. SLD-superluminescent diode, L1-L4 – Lenses, PM-partial mirror, RM-reference mirror, VCM-voice coil motor, SG-signal generator, PD-photodetector, XY-GS-galvo scanner, DM-dichroic mirror, OW-optical window, CD-camera driver, CCD-charge coupled device. Fig. 2 (a) Schematic representation of the systematic increases in the magnitude of each successive scan region associated with the increasing number of reflections of the reference light. “s”-scan range of VCM and “d”- separation distance between partial and reference mirror at the center of scan. (b) Reflection between PM and RM for the first three orders. (c) Calculated scan range measurement of VCM used in experiment with s = 55 μm and d = 90 μm resulting in a total scan range of 1mm. Fig. 3 Flowchart of the MR-OCT processing scheme. Fig. 4 Flowchart for co- registering the MR-OCT beam with a dermascope image. ROI – region of interest. Fig. 5 Reconstructed movement of sample mirror. The x-axis corresponds to actual sample mirror movement and the y-axis is the reconstructed image of the movement. Fig. 6 Measured sensitivity plot of the MR-OCT system with 10 successive reflection orders with 1.1 dB roll-off per order. Fig. 7 (a) Dermascope image of a fingertip area. (b-e) shows the MR-OCT A-scans of a human fingertip recorded in vivo at different regions of interest marked as b-e in (a).The signal peaks indicate the (optical) positions of the reflecting interface. The measured dermal to epidermal junction thickness using the MR-OCT system was ~540μm. Fig. 8 (a) MR-OCT cross section image of a fingertip with dimension ~[1 mm (z) × 1.5 mm (x)]. (b) Cross-sectional A-scan profile of a fingertip using the MR-OCT system. (c) SS-OCT cross section image of a fingertip with dimension ~[1 mm (z) × 1.5 mm (x)]. (d) Cross-sectional A-scan profile of a fingertip using the SS-OCT system. The measured dermal to epidermal junction thickness using MR-OCT system was ~540 μm, which compared well with the measurement by the SS-OCT system (~550 μm). Fig. 9 (a) Dermascope image of a wound near forearm region. (b-e) shows the MR-OCT A-scans of a wound region recorded in vivo at different region of interest marked as b-e in (a). The signal peaks in (b-d) shows the optical reflections from wound area representing burnt region whereas (e) represents the reflection from a healthy region. Fig. 10 (a) MR-OCT cross section image of a wound near the forearm region with dimensions ~[1 mm (z) × 1.5 mm (x)]. (b) A-scan profile of a wound using the MR-OCT system. (c) SS-OCT cross section image of a wound with dimension ~[1 mm (z) × 1.5 mm (x)]. (d) A-scan profile of a wound using the SS-OCT system. The measured burn depth using the MR-OCT system was ~650 μm, which compared well with the measurement by the SS-OCT system.